Learn how to dry chives easily. Simple step by step instructions from cutting chives in your garden to freezing chives to sun drying chives. I show you how to store your dried chives. You have options when saving chives for recipes. Use your dried chives in recipes such as my easy Mexican corn dip recipe or this cobb dip recipe. Easy, delicious recipes to share with friends and family. Drying chives is a great way to save them and use them all year long. 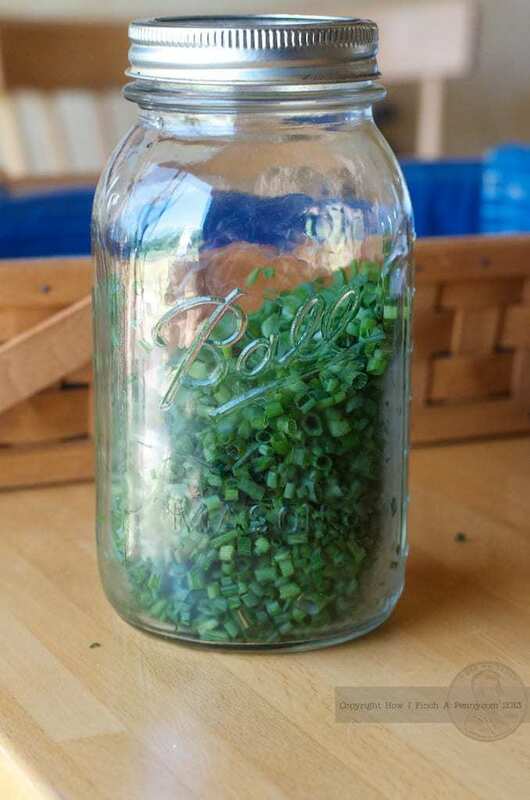 I show you two easy way to preserve chives at home. The chives in my herb garden are ready to be cut. They have gone to flower and it is time to harvest them for drying. Be sure to cut your chives in the morning. They will be full of flavor and not parched after a day of summer sun. Cutting chives is super simple. All you need is a pair of scissors. If you have pruning sheers that is fine too but just a simple pair of scissors will do you just fine. I leave about and inch of the bundle uncut. It is better for the plant. The plant as a whole, needs to have sunlight to grow and thrive. If there is nothing to absorb the sun then the plant is not able to process the sunlight. Make sense? I pull out any chive flowers, grass or dead and withered chives. Chive flowers are pretty but the stalk of the flower is too woody for me. Bring them inside, wash and dry your chives. Cut the chives as small as you can.I strive for less than a 1/4 inch. This is how many chopped chives that bundle pictured in the basket turned out to be. Spread the chives in a single layer on a cookie sheet . Be sure to use with either parchment paper or a silpat sheet, like the one I have in this photo. Pop the sheet in the freezer for at least 30 minutes or until frozen. Once the chives come out of the freezer you have to be quick! If it is hot in your kitchen, like it is in mine, they are going to defrost quickly! This is where you will be glad you used either parchment paper or a silpat on the cookie sheet. Carefully pick up your parchment or silpat and fold it to create a funnel so you can pour the frozen chives into a freezer safe container. Because you froze them in a single layer they are frozen individually and should scoop out of the jar easily. Spread your chopped chives on your silpat or parchment paper lined cookie sheet. Set it outside in direct sunlight until dry. Every once and a while toss the chives to make sure they are drying evenly. How do you dry chives? Look at the difference at the volume once they are dried! These were dried in the sun for 6 hours when the temperature was 90 degrees. Drying time will depend on the moisture content of your chives, the volume of your chives, the heat and the humidity on the day you are drying them. Once they are thoroughly dried use the silpat or the parchment paper to funnel them into a dry container with a tight fitting lid. You want to be SURE there is no more moisture in the chives. Moisture will just breed bacteria and mold that might be present. Do you see how much less space dried chives take up versus the frozen chives? I used approximately the same amount of chives on each tray and the dried chives barely fill a pint jar where as the frozen chives halfway filled a quart jar. So basically drying your chives will shrink the volume by half. Store your dried chives in a cool dry place and they are ready to use! I store mine on the back of my stove. Interested in more herb posts? Here is how I save cilantro. It is a post from 2009 but the method is still current! Interested in more freezer posts? Want to see what I am pinning on Pinterest? Here is my Canning & Freezing Board.